Note: Illustrations depict generic pumped hydro behavior on a regional electric power system but do not represent any actual existing power system. Pumped hydro storage plants serve an important role on electric power systems: they improve system-wide efficiency and reliability by allowing system operators to time-shift power generated during periods of low demand for electricity for use during high-demand periods. Pumped hydro storage operates by using electrically powered turbines to force water uphill at night to fill a reservoir. During times of the day when electricity demand is high, the water is released to flow downhill through turbines to generate electricity. Although more electricity is used to force the water uphill at night than is produced when it flows downhill during the day, shifting the availability of power from overnight generation to serve daytime load adds significant value. 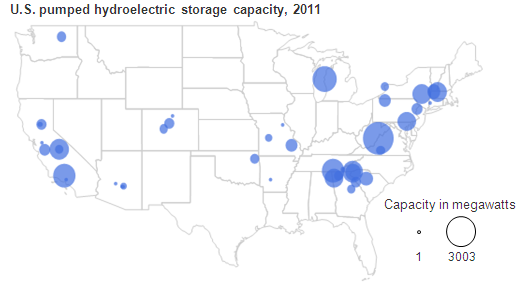 There are 40 pumped storage plants operating in the United States (see map below) totaling more than 22 gigawatts (GW) of storage capacity, roughly 2% of U.S. generating capacity. There has been increased interest in building new pumped storage plants, although construction has not yet been authorized. According to the National Hydropower Association, as of January 2012, the Federal Energy Regulatory Commission had granted preliminary permits for 34 GW of pumped storage capacity over a total of 22 states, which would more than double existing capacity. There are, however, significant challenges to building new pumped storage plants, including licensing, environmental regulations, and uncertainty in long-term electric markets. Pumped storage plants play an important role in electric load shifting (see the May 21, 2012 Today in Energy article for a thorough discussion of load shifting and arbitrage opportunities in power markets). They typically consume electricity during low-demand hours (e.g., nighttime), helping baseload plants to operate more efficiently by minimizing unwanted cycling on and off (a particular concern for nuclear plants, where cycling is extremely expensive and time-consuming). Subsequently, the gross generation that pumped storage plants put back on the grid is produced when electricity demand is high (daytime). This load shifting helps reduce generation from less efficient and more expensive plants, such as combustion turbines, that would otherwise operate during peak-demand hours. In 2011, pumped storage plants produced 23 billion kilowatthours (kWh) of gross generation—roughly as much as petroleum-fired generation in that year. Pumped storage plants, however, consumed 29 billion kilowatthours (kWh) of electricity in 2011 to refill their storage reservoirs, resulting in a net generation loss of 6 billion kWh.